CICE4 is the latest version of the Los Alamos Sea Ice Model, sometimes referred to as the Community Ice CodE. It is the result of a community effort to develop a portable, efficient sea ice model that can be run coupled in a global climate model or uncoupled as a stand-alone ice model. 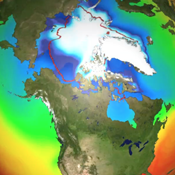 It has been released as the sea ice component of the Community Earth System Model (CESM), a fully-coupled global climate model that provides simulations of the earths past, present and future climate states. CICE4 is supported on high- and low-resolution Greenland Pole and tripole grids, which are identical to those used by the Parallel Ocean Program (POP) ocean model. The high resolution version is best suited for simulating present-day and future climate scenarios while the low resolution option is used for paleoclimate simulations and debugging.